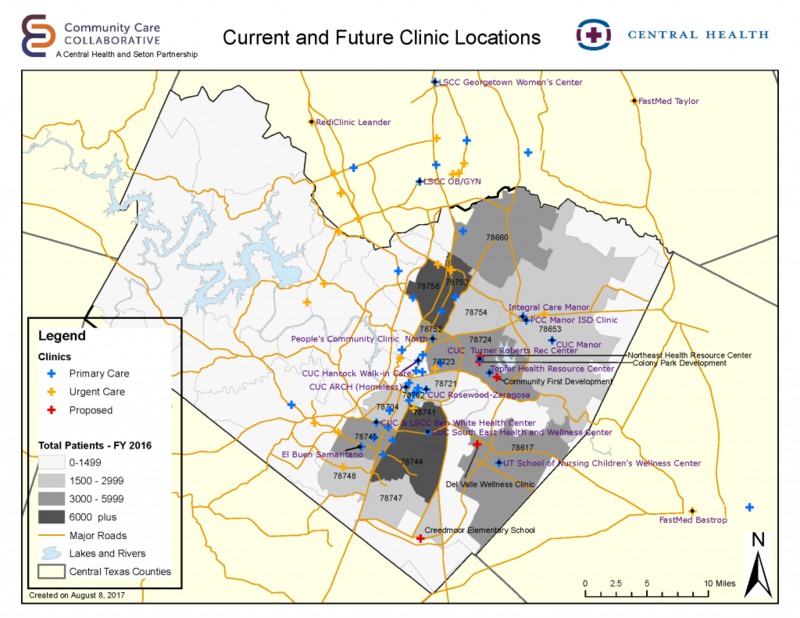 (AUSTIN, Texas) – Central Health and a coalition of community partners announced today their plans to increase health care access in Eastern Travis County through a series of short and long-term initiatives over the next several years. Central Health − the health care district serving Travis County residents who are low-income and uninsured − convened a multidisciplinary team of community-based health care and service providers representing more than a dozen organizations. Called the Eastern Travis County Health and Wellness Collaboration, the coalition’s purpose is to address the challenges faced by residents of Eastern Travis County as they seek needed health services. As more people move to communities such as Del Valle, Manor, and Colony Park, this need is becoming more acute. Del Valle. For an interim solution, Central Health and Travis County would use the county’s existing employee health clinic off FM 973 — adjacent to the county’s correctional facility — for health care services for the general public, two to three days a week. Central Health is planning for a permanent health facility in the future, which the county is building on the same property. Further, the UT School of Nursing is exploring the possibility of expanding services in Del Valle. While the nursing school operates the UT Children’s Wellness Clinic in Del Valle, adults aren’t seen at that location. The school recently signed a new contract with the Community Care Collaborative, Central Health’s partnership with Seton Healthcare Family, to provide services to adults at its Austin clinic. Del Valle ISD also recommends placing an adult health clinic (modular building) at Creedmoor Elementary School. Community First! Village. Just south of Colony Park, Mobile Loaves and Fishes operates an innovative community for those who have experienced homelessness. Founder Alan Graham has offered to assist with construction of a health center modeled (on a smaller scale) after Central Health’s successful Southeast Health & Wellness Center in the Montopolis neighborhood. With a targeted opening date of December 2018, the facility would serve both those transitioning from homelessness as well other Eastern Crescent residents. Central Health has earmarked $1.5 million in FY 18 to support health care initiatives for Eastern Travis County.